One of the defining features of Phyllida Barlow’s sculptures is their scale. Often reminiscent of natural forms such as rock formations, they tower over you, sometimes with immersive effect. This was the case, for example, at her 2015 solo show at Fruitmarket Gallery in Edinburgh, which transformed the space into a claustrophobic series of close-up encounters with her work as the viewer navigated through various pinch-points. Rock formations are an apt starting point for Barlow’s work, which could be placed in a lineage of twentieth century British sculptors who have referenced organic forms such as the beach pebble – most obviously the modernism of Barbara Hepworth and Henry Moore. Whereas their sculpture takes the humble seaside stone and transforms it into something sleek and abstracted, carved from stone or cast in heavyweight bronze, Barlow’s sculptural forms are rough, messy, eroded, often showing the material or process of their making and incorporating appropriated and ephemeral materials. Barlow’s work has been brought to Margate as part of the ‘Artist’s Rooms’ series of touring exhibitions. This places a regional spotlight on Barlow’s five-decade career at the same time as she represents Britain internationally at the Venice Biennale; her work is shown alongside that of the British-Kenyan artist Michael Armitage, a former student of Barlow’s at the Slade. Armitage incorporates imagery from African mythology and current social and cultural issues into a series of remarkable narrative paintings in densely worked, luminous paint on textural lubugo bark fabric. Designed by David Chipperfield, the Turner Contemporary is an iconic building overlooking Margate harbour, which created a new physical and cultural landmark in the town when it opened in 2011. The self-consciously modern development stands alone at the harbour’s edge; it is made particularly striking by its setting in a Victorian townscape of tall, narrow terraces. 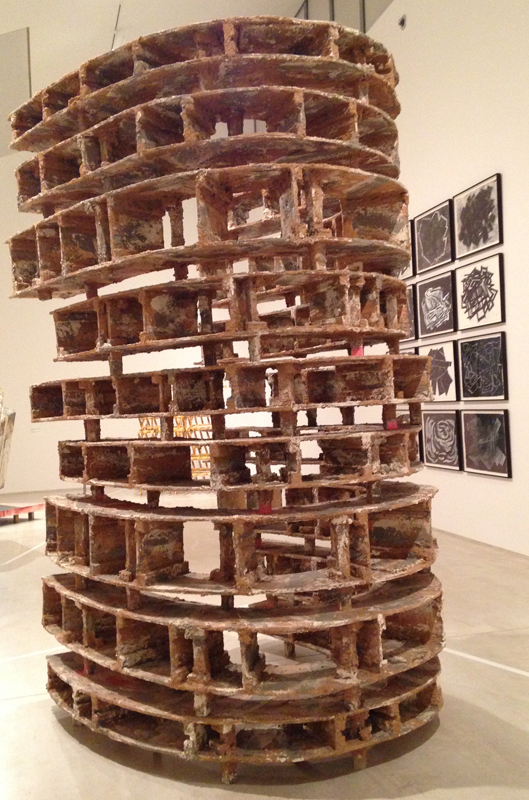 A strong architectural influence is apparent in Barlow’s work. This runs through her work on paper, in particular her pencil drawings, which have an air of the study or plan about them, all angles and perspectives. Sometimes they suggest interiors, at others a maze or labyrinth, or the footprint or outline of a building. 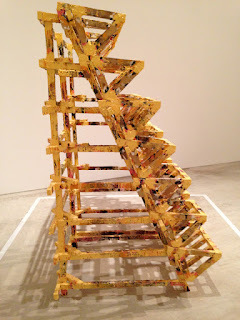 It’s also apparent in the materiality of her work, which uses material such as wood, sand and mesh frames, overlaid with crude and thick layers of paint. 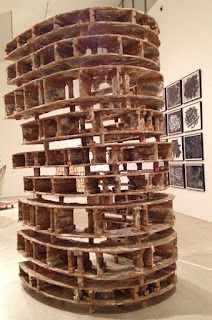 Most of all, it’s visible in her sculptures, which suggest the Colosseum in Rome (‘untitled: holder’, 2014), at one extreme, and the garden shed at the other (‘upturnedhouse 2’, 2012). ‘upturnedhouse, 2’ also brings to mind Richard Wilson’s ‘18 Holes’, commissioned for the first Folkestone Triennial in 2008. 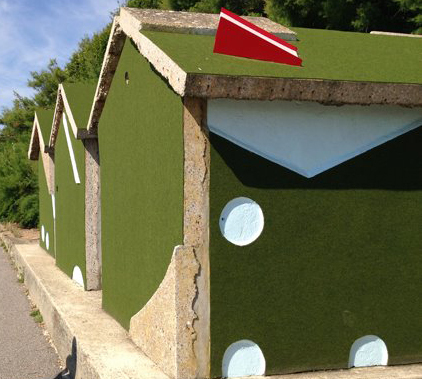 For this large-scale public work, in another former seaside resort looking to art for regeneration and reinvention, Wilson recycled large slabs of crazy golf surfacing from the nearby Rotunda amusement park, demolished to make way for a residential, retail and leisure development, in order to build a trio of new beach huts. In doing so, he brought together two archetypal forms of seaside recreation, inserted into a uniform row of standard issue concrete huts to be stumbled across as an unexpected encounter with art. The constituent parts of Barlow’s sculptures often resemble building blocks; they appear unstable, as if in a state of perpetual assembly and dismantling, caught between balance and stability, strength and fragility, much like the architectural and natural landscape of this stretch of coast. One of the Turner Contemporary’s selling points is its panoramic views out to sea. 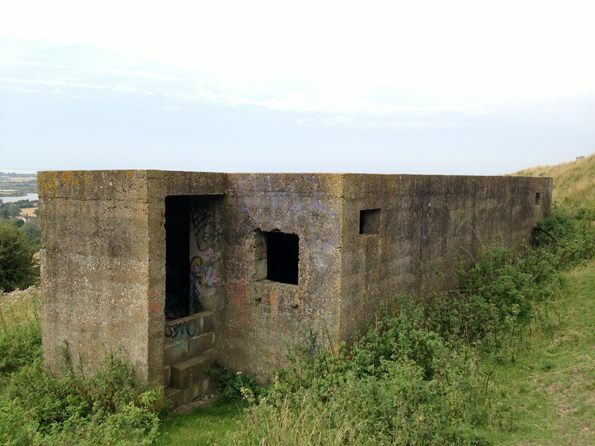 Seen in this setting, Barlow’s sculptures invite comparison to the defensive architecture of this area, which acted both as deterrent and as vantage point from which to spot any potential attackers. From Essex in the north to Sussex in the East via Kent and Romney Marsh, these largely flat lands have been subject to successive layers of attack, from anticipated Napoleonic invasion to wartime bombing raids to the ongoing onslaught of the sea. The response to these threats has left its mark in the landscape, from solid brick Martello towers and redoubts, some still standing and other crumbling slowly into the sea, to modern rock groynes and concrete sea walls. 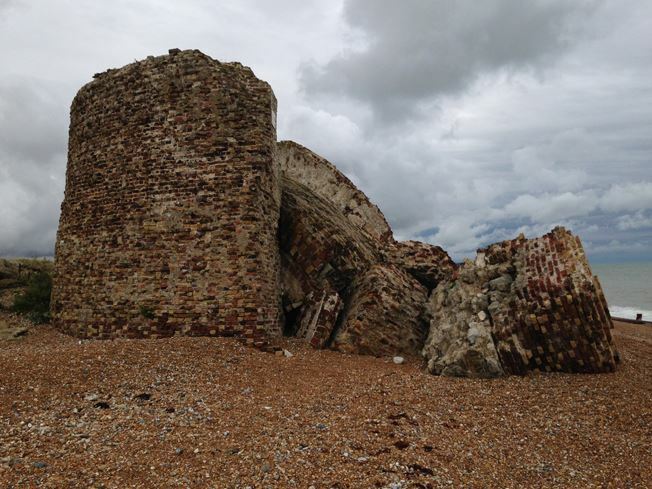 Barlow’s 2015 work ‘Tryst’, though not shown here, resembles the monumental Maunsell Sea forts, fortresses built during the Second World War and raised high on stilts above the sands off the coast of Kent. 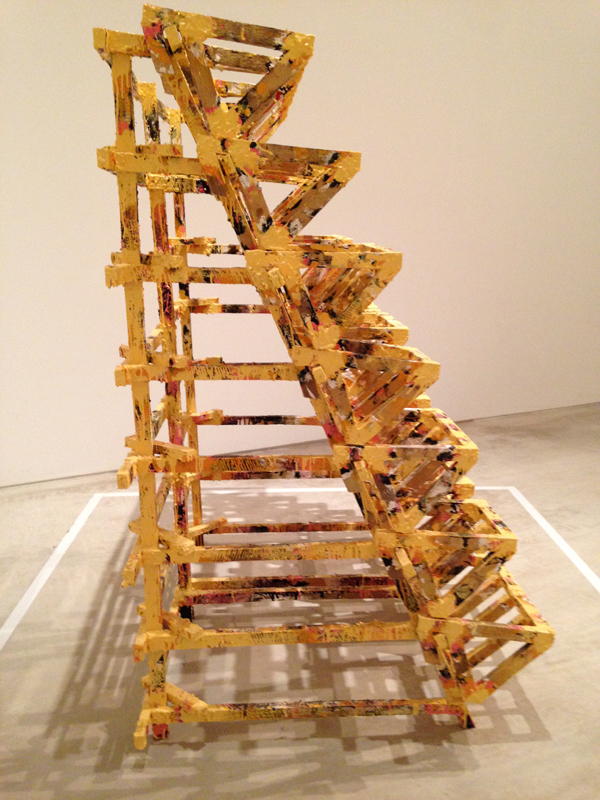 Others make more utilitarian references, suggesting steps, staircases and stacks, as seen in ‘Untitled (Yellow Racks)’ (2006). ‘Awnings’ meanwhile, suggests a series of flags: a coded message or warning. More than any sculptor, the reference point that seems closest to Barlow’s work is the painter and photographer Paul Nash. It’s easy to return to Nash, yet his depictions of Romney Marsh are still unequalled, and he found much inspiration in the Kentish landscape. 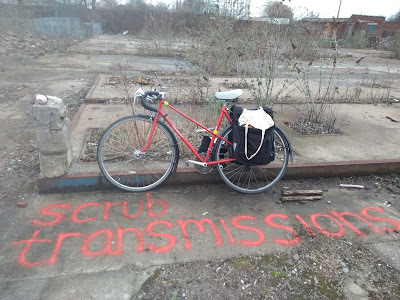 Just as Turner is celebrated for drawing on the particular qualities of light and skies that characterise Margate, Nash’s recognisable brand of British Surrealism conveys the ultra-vivid strangeness of Romney Marsh, 35 miles to the west. In a muted palette of dusty, desert colours, Nash depicted the expansive vistas around the bay, the luridness of its light, and a landscape still punctuated with defensive architecture, from sea walls to pillarboxes now silted up neck-high with shingle. Like Barlow, his paintings suggest layering and stacking: the steps that separate the promenade from the beach below, the wall that guards the farmland from an encroaching sea, and the overlapping waves that stretch out like ominous slabs towards the moon. 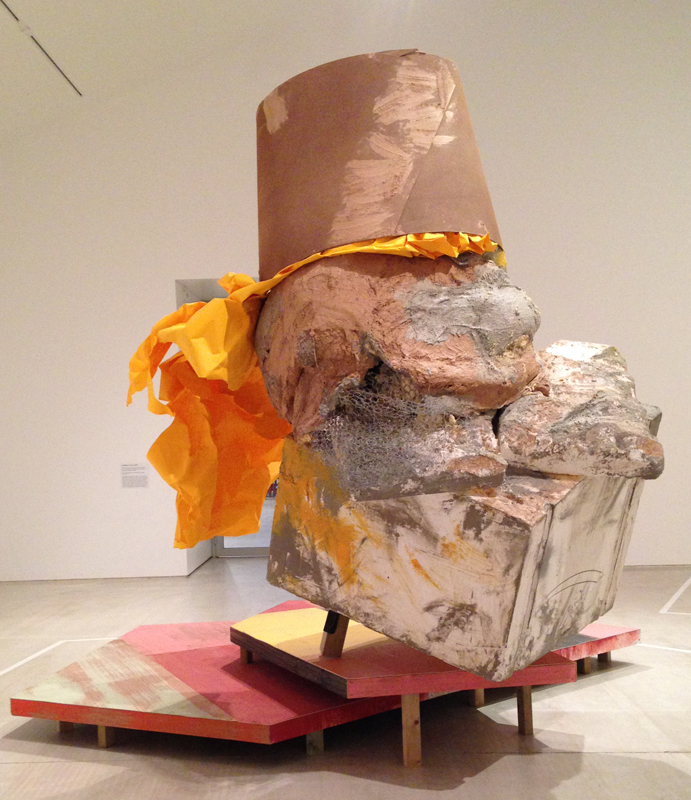 Like the work of Nash and other British surrealists, Barlow’s work transforms our perception of forms and materials, and the nature of sculpture. It suggests a negotiation between the familiar and the mystical, and an ability to transform the everyday. 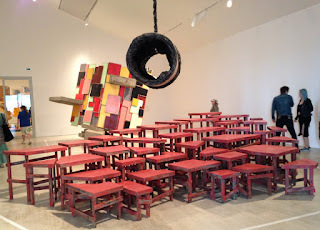 In ‘Hoard’, a tube is suspended above an uneven surface of tables, stacked like crazy paving or stepping stones. It could be a pipeline, a piece of functional infrastructure, or it could be the moon, illuminating anew in its particular way a landscape below. 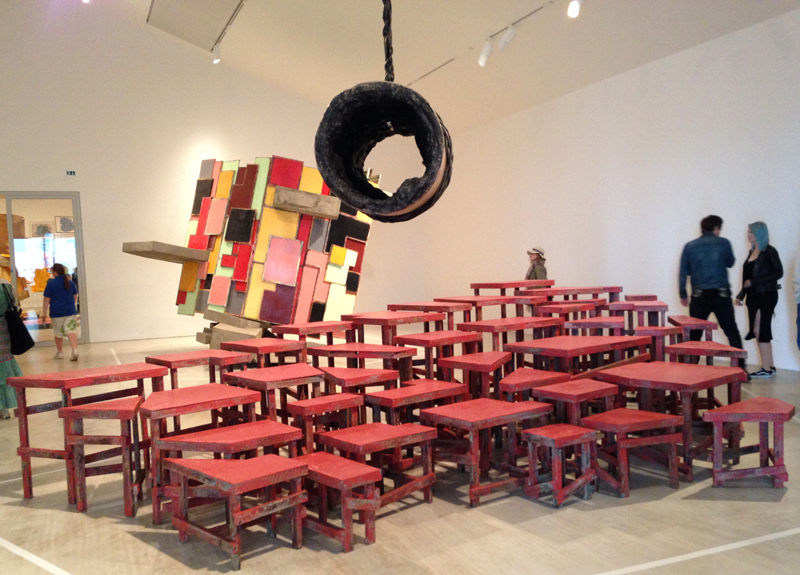 Phyllida Barlow: Artist Rooms is at Turner Contemporary, Margate as part of Every Day is a new Day (with the paintings of Michael Armitage) until Sunday 24 September. 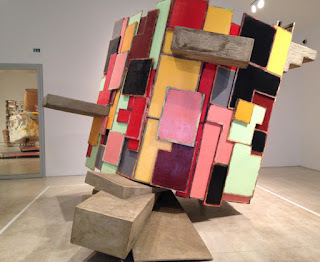 For more information visit www.turnercontemporary.org/exhibitions/phyllida-barlow-artists-rooms. The Shrieking Violet is teaming up with Steve Hanson for a guest DJ set (vinyl only!) 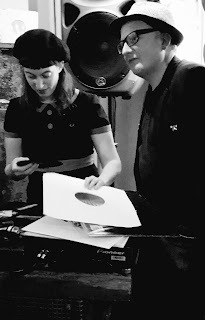 at indie-pop night Recordsville Social. 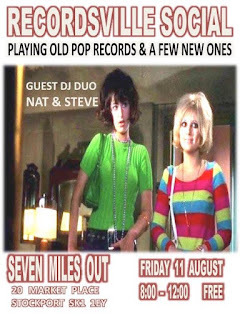 Recordsville is taking place at Seven Miles Out (opposite Stockport market) on Friday 11 August from 8pm-12am. Free entry!